I have been trying to copy some disk images in ATR format via the APE and Prosystem PC applications, via SIO2PC (USB) and Atari 1050 drive. I know the drive and interface work because I've successfully loaded programs from both into my 800XL. The problem is, when I try to transfer the disk image to real floppy, the copy fails - I believe this is because all of the ATR images I'm finding online are double density (180kb), and my stock 1050 disk drive is only designed to read/write single density. Does this sound correct? And if so, is there any convenient way around this, aside from upgrading my 1050 to read/write double density? I'd be content to just load files from the emulated drives available via APE and the SIO2PC interface, but the interface is on loan from a friend so I'd like to get some disks made before returning it. This won't work for any commercial software images. They aren't formatted in standard DOS layout and must stay on their original density. You can format a 5.25" floppy in your 1050 using SpartaDOS XINIT.COM or MyDOS or DOS 2/2.5 format. Then you can boot from APE in D1: and have the double density .ATR you want loaded, say at D4: on APE. Now you can copy individual files, or alphabet choices from D4: to D2: using the COPY command in SpartaDOS or MyDOS copy command, using wildcards. a Sparta boot disk, COPY the *.DOS file to D2: then "BOOT D2:X32G.DOS" if that's the Sparta version you're using. Edited by russg, Fri Dec 28, 2012 9:55 AM. Thanks guys! I will try both methods. Are there any Atari DOS quick command references, and .atr disk image editors, that you'd recommend? Ok, so I'm having success creating single density (or "enhanced" since I'm using a 1050) .ATR images, moving files over from existing double density images into them, and copying these ATRs over to real floppy. Thanks for the link to the ATR editor info! 1 - the disk images have several games on them, listed first when I view them in an ATR editor like makeATR. Then below that, there's a ton of garbled text. I don't know if these are necessary files or what. 2 - I copy just these files over to real floppy via SIO2PC/Prosystem using my newly created single density ATR file... and it works, but then when I boot up the Atari nothing loads. "BOOT ERROR". 3 - I tried again but included a DOS file (.DOS file from a SpartaDOS disk) thinking that perhaps it couldn't boot because it needs this, but that time I got "Error: No DOS". I don't know anything about Atari DOS or what the computer needs to load files. Does it need to load some type of operating system from a disk like an early IBM PC to have any capability at all? Or does it have some built-in DOS capabilities like a C64? The Atari needs to load DOS - in some form - from the disk, when it's powered on with a disk drive connected. With "conventional" Atari DOS (DOS 2.0 or 2.5) there are 2 files - DOS.SYS and DUP.SYS. DOS.SYS is DOS (sorry I'm not well-versed, here) and DUP.SYS is "Disk Utility Package." This is a menu-driven DOS, rather than command-line driven, like SpartaDOS. With a "conventional" bootable DOS disk (will get to unconventional in a moment) there needs to be DOS.SYS as a minimum. If you want to get to the DOS menu (sort of - from a functional standpoint - kind of like being a a command prompt) it will need to load DUP.SYS. For example, if you boot with BASIC enabled and you're at the "READY" prompt, and you want to do some DOS functions, you type "DOS" and it then loads the DUP.SYS and goes to the DOS menu. With these DOSses, you can autoload a binary file - say a game - by naming it "AUTORUN.SYS". Say you had a binary load game you wanted to run (just one) then you could format a blank disk, write DOS.SYS to the disk, copy the game to the same disk, rename it AUTORUN.SYS, and skip DUP.SYS since you're just going to autoload the game and never need to load the Utility Package (DOS menu). You'd boot with BASIC disabled and it would load the DOS.SYS and then the game (now called AUTORUN.SYS) automatically. This is just for the sake of argument, to discuss what part of DOS would be required. In reality, this would be a terrible waste of disk space, because you've just wasted an entire disk for one game; this was just to illustrate the necessity (or lack thereof, in this case) of the DUP.SYS file. For multiple games, you'd need to be able to access the DOS menu to select which file to load. So you'd format a blank disk and write DOS.SYS and DUP.SYS to it, and now it's bootable to the DOS menu (with BASIC disabled, of course). You could copy as many binary load games to this disc as you'd have room for. 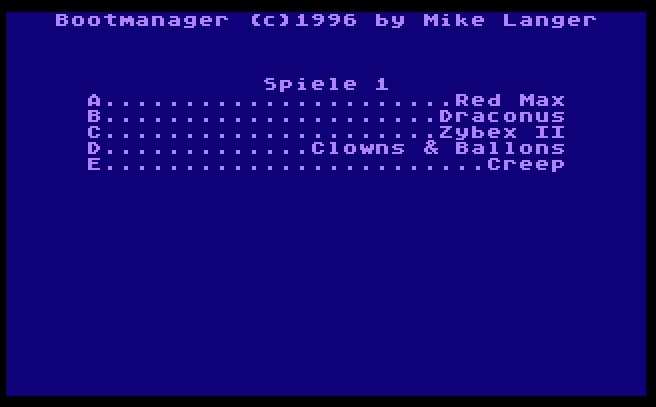 You'd then use the DOS menu (necessitating the DUP.SYS file to get there) and then view a directory, pick out a game to load, and then use the [L]oad menu selection and type the name. This is how I did it as a beginner, of course, long ago. (the "unconventional" part): But then, you're wasting disk space, with DOS.SYS and DUP.SYS, where another game(s) could reside on those sectors, and wasting time waiting for all the DOS.SYS and DUP.SYS to load. So enterprising folk (not me!!!) made little "mini-DOS" type loaders, that load in a few sectors, and then bring up a menu of binary files on the disk, for you to choose from. There are several of these in existence, and they're definitely the way to go when making game disks. It's been so many years since I made one (literally) that I can't remember, but I think you use a utility to write those sectors (the mini-DOS). There are so many more knowledgeable people here that they'll tell ya. .....so when you copy the files from it to another disk, the mini-DOS-type-thingy sectors isn't copying; just the game files. Frequently, once you create one of these mini-DOS (bootloader) disks, you won't see the mini-DOS bootloader thing on a directory of the disk, as it's kind of hidden in a few sectors. Hence my layman's term of calling this "unconventional." But very neat! What you need is the utility (A utility) to write this to your disk, in the density which you are using. I've been out of the loop (and using other people's images) for SO LONG I can't recommend one, on account of I'm ignorant in these matters. But stuff like "MyPicoDOS" (author is on AtariAge and it is awesome) is (I think) what you are looking for. Now that I've wasted your time with my extreme layman's perspective, someone else can correct my mistakes and make a proper recommendation. I tried! Thanks so much for taking the time to explain some of this. It's all new to me so this is very helpful. This did not work... the drive spins up for a second, then I get "ERROR - 21". Alas, there are lots of ML files that overwrite DOS, so they cannot be loaded with DOS binary load function (often you will see a message like "need MEM.SAV to load..." but in reality DOS cannot load this file at all). Thats where those mini-DOS or gamedos programs come into play, they need less memory, since they only load files (no copy, delete, rename, erase, or other DOS function they only load a file). Edited by CharlieChaplin, Sun Dec 30, 2012 8:35 AM. I'm not sure what you mean by 'load something from the DOS prompt'. Since you are typing LOAD"D:FOOTBALL", you are at the Atari BASIC READY prompt. the BASIC 'READY' prompt. Now you can try to load FOOTBALL (probably has FOOTBALL.COM) from MyDOS DUP.SYS menu, with the 'L' (LOAD) option. Hit 'L' then type FOOTBALL or whatever is on the disk. With MyDOS you would just hit a number to get the directory of that drive. put the X32G.DOS on the disk you want to make a boot disk of and type, at the Sparta 'D1:' screen, type 'BOOT D2:X32G.DOS' that will make a Sparta boot disk on the D2: drive you have a real floppy on. Oh, but first you have to format the D2: floppy before you can add anything to it. The key here is to get the 'D1:' Sparta prompt you've booted from an SpartaDOS boot .ATR on APE. With MyDOS 4.53, you would boot from a MyDOS .ATR, holding OPTION and get to the DUP.SYS menu. Then you would have to format a real floppy in, say, D2: from MyDOS menu, and then write DOS files to it to make it bootable. 'mini' DOS to make a boot disk of several games like the menu disk you used earlier. You have to find the program that writes the picoDOS to a floppy, then copy your game files to the floppy. a sector copier like Sparta SCOPY (I think that one is not good). There are other sector copiers, I don't know about, you can use my RW12.COM for instance. 1. format your single density floppy (you can put a notch on the un-notched side and use both sides of the floppy, called a 'flippy'. There are special notch making tools. 2.make the floppy bootable with MyDOS init or SpartaDOS XINIT, or probably best, use mypicoDOS. 3. Either sector copy a single density disk from APE .ATR to your real floppy or write boot code using MypicoDOS or other Menu making program and copy the files to that floppy that you want. I remember MENUMAKR from years ago, it gave an option to format the disk as well as make the boot menu code. Edited by russg, Sun Dec 30, 2012 8:53 AM. Ok, so I copied MypicoDOS over to a real floppy. The 800XL boots with this disk, then pops up a menu. When I insert a blank formatted disk (tried single density, enhanced density, multiple good disks) and select "init disk" followed by the corresponding drive #, it fails and says "error creating PICODOS.SYS." Then I tried creating a new .ATR image via the makeATR editor, hoping I could just put the DOS files on there along with some games. The disk does not boot - "BOOT ERROR". When creating this image, I've tried including the DOS.SYS and DUP.SYS, as well as putting ALL the files from the MypicoDOS image, still does not boot. Even when trying to create an .ATR that has NOTHING BUT the files from the MypicoDOS image, the disk doesn't boot. Booting from SpartaDOS on APE drive 1, I attempted to copy a single game from APE drive 3 over to real floppy in drive 2, which has been formatted by SpartaDOS and made bootable. It appeared to copy the file, but then when I tried to boot from the new disk I got the SpartaDOS screen and when doing a DIR D2 it shows no files. I think I need to just buy a double density upgrade for my 1050 so I can just dump the .ATRs over in bulk, or maybe some kind of SD card data storage unit... this is too painful... if I went with SD data storage, any suggestions on what's easiest to use? Edited by CharlieChaplin, Sun Dec 30, 2012 6:21 PM. You're coming along. You've made progress. Things will settle down. Sorry. If you type 'DIR D2' at the D1: SpartaDOS prompt, you will get no files reported. It will look for a file named D2. You have to type 'DIR D2:' or 'DIR D2:*. *', using wildcards can be useful. Gotta put the colon in there. a menu disk, without BASIC. Oh, and lots of the best games don't load from menu disk even. You gotta load them from an .ATR, using APE (or ASPEQT) or sector copy them from APE drive to your 1050. Just one game per disk that boots the game. game ATRs you can find will work with APE. There are some .PRO images you can use also. A little expensive if you buy APE software and an APE USB adapter. Edited by russg, Sun Dec 30, 2012 7:15 PM. One more thing. It is hard to find 5.25" floppy disks now. And you can't use high density floppies, have to use double density. The double density come with a hub ring, a re-inforcement ring around the hole. High density have no ring. I've got it working now, both methods. Victory! Thanks! As it turns out, the file HAD copied after all. I have learned a little more about SpartaDOS, plus the very helpful advice here. It's a little like MS-DOS which is good for me. I don't understand why I wasn't able to make my own MypicoDOS bootable disks, but the ones graciously provided above work fine. I can dump games on them in makeATR and copy to real floppy, works. That's going to be faster than manually copying files via SpartaDOS, although the knowledge gained there is good to have. My primary purpose here is to create music and maybe GFX, more so than play games, so file handling is necessary. Do all Atari 8-bits have BASIC built in? Curious since there is a cartridge for it as well. Also, how long do I need to hold down option to disable it? When necessary, do I need to do this only once as the computer boots? Also, when creating images via makeATR, I can specify different formats for a disk... for different DOSes. Maybe I chose the wrong type when creating my bootable image. FYI, I have hundreds of new stock DS/DD floppies that work great with all my 8-bits... no problems there! Thanks again for the ongoing help. Wouldn't have made it this far without it! And about modern file transfer and storage, would you guys recommend any SD based options? SIO2PC w/ APE seems the most versatile, but requires a PC. With chiptune exhibitions in mind I would benefit from a more self-contained solution. 400/800/1200Xls do not have basic built in hence the need for basic on cart. Edited by mimo, Mon Dec 31, 2012 11:22 AM. Thanks. There are a lot of options to sort through. The SIO2PC/USB looks pretty awesome... anything that combines PC hardware emulation AND standalone SD storage should be optimal. sio2pc USB is not a stand alone device, it just plugs into your pc USB port rather than the original sio2pc serial port version. I don't have one but there is an SIO2SD. Takes a FAT32 formatted SD card, and has a little LCD display that lets you choose the files from the SD card and insert them into D1-D4. Fast. I use a SIO2PC connected to a little PC laptop with a serial port. Works well, but obivously you need to have another computer to serve up files to the Atari. For standalone I think SIO2SD is what you're looking for. But wait... you guys haven't seen this? Unless I'm misunderstanding something, it's supposed to do both (standalone SD storage AND SIO2PC/USB interface). I've asked Santosp (the creator) about it, he's out of them but will be getting back to me... it looks perfect.